The solubility of this compound in DMSO is >25.4mg/mL. General tips for obtaining a higher concentration: Please warm the tube at 37℃ for 10 minutes and/or shake it in the ultrasonic bath for a while. Stock solution can be stored below -20℃ for several months. Co-treatment with 1.0 nM 17β-estradiol and bazedoxifene had an IC50 of 22.0 nM in CHO cells, 4.97 nM in HepG2 cells, and 10.0 nM in GT1–7 cells. In HepG2 cells transfected with hepatic lipase promoter luciferase construct, bazedoxifene functioned as an agonist with an EC50 of 100.0 nM. In MCF-7 cell, co-treatment with 17β-estradiol and bazedoxifene dose-dependently inhibited cell proliferation with an IC50 of 0.19 nM. In an immature rat uterine model, bazedoxifene (BZA) increased uterine wet weight by 35% at 0.5 mg/kg andno significant difference at 5 mg/kg. Histological examination of the entire uterus revealed BZA does not affect luminal epithelial cell hypertrophy or hyperplasia, myometrial hypertrophy, or luminal distention. BZA resulted in only a slight, insignificant increase in luminal cell height. Komm B S, Kharode Y P, Bodine P V N, et al. Bazedoxifene acetate: a selective estrogen receptor modulator with improved selectivity[J]. Endocrinology, 2005, 146(9): 3999-4008. 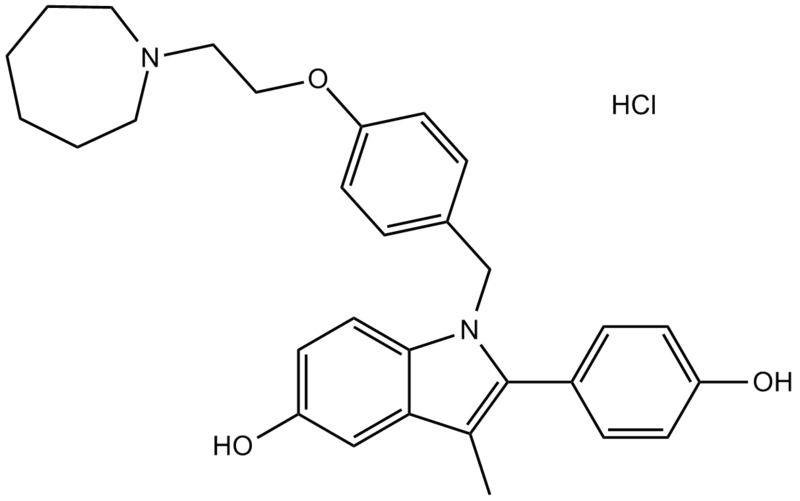 Bazedoxifene HCl is a novel, non-steroidal and indole-based estrogen receptor modulator (SERM). The IC50 value of bazedoxifene against ERα and ERβ is 23 nM and 89 nM, respectively [1,2]. The estrogen receptor (ER) contains two subtypes, ERα and ERβ. ERs are widely expressed in different tissue types such as kidney, brain, bone, heart, prostate, and endothelial cells. Estrogen and the ERs have been involved in most cancers such as breast cancer,ovarian cancer,colon cancer,prostate cancer, and endometrial cancer . In vitro: Bazedoxifene is a selective SERM currently in development for osteoporosis prevention and treatment. Bazedoxifene was the third generation SERM. In cultured breast cancer (bMCF-7) cells, bazedoxifenedidn’t stimulate ERα mediated transcriptional activity and acted as an antagonist to estradiol. Similar results were also seen in other cell lines including CHO (ovarian), HepG2 (hepatic) or GTI-7 (neuronal) with bazedoxifene having no ERα agonist activity and acting as an antagonist to estradiol action .Bazedoxifene didn’t stimulate proliferation of MCF-7 cells but inhibited 17β-estradiol-induced proliferation with an IC50 value of 0.19 nM . In vivo:In an immature rat model, bazedoxifene increased uterine wet weight 35% at a dose of 0.5 mg/kg compared to an 85% increase with raloxifene at the same dose and a 300% increase in uterine weight with ethinyl estradiol at a dose of 10 μg/kg. Ovarectomized rats treated with 0.3 mg/d bazedoxifene displayed maintenance of bone mass and bone strength similar to effects seen with 2 μg/d ethinyl estradiol, 3 mg/d raloxifene, or sham operated animals. In an immature rat uterine model, bazedoxifene (0.5 and 5.0 mg/kg) was associated with less increase in uterine wet weight than either ethinyl estradiol (10 μg/kg) or raloxifene (0.5 and 5.0 mg/kg) .
. Miller C P, Collini M D, Tran B D, et al. Design, synthesis, and preclinical characterization of novel, highly selective indole estrogens[J]. Journal of medicinal chemistry, 2001, 44(11): 1654-1657.
. Biskobing D M. Update on bazedoxifene: A novel selective estrogen receptor modulator[J]. Clinical interventions in aging, 2007, 2(3): 299.
. Harris H A, Albert L M, Leathurby Y, et al. Evaluation of an estrogen receptor-β agonist in animal models of human disease[J]. Endocrinology, 2003, 144(10): 4241-4249.
. Komm B S, Kharode Y P, Bodine P V N, et al. Bazedoxifene acetate: a selective estrogen receptor modulator with improved selectivity[J]. Endocrinology, 2005, 146(9): 3999-4008.